For 2015 the Mazda 6 has undergone an early revamp to counter some minor criticisms of the original Skyactiv model. 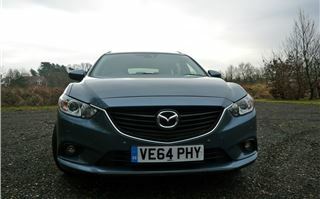 You can read our October 2013 road test here, and what it was like to drive 14,000 miles in a Mazda 6 Skyactiv diesel automatic here. 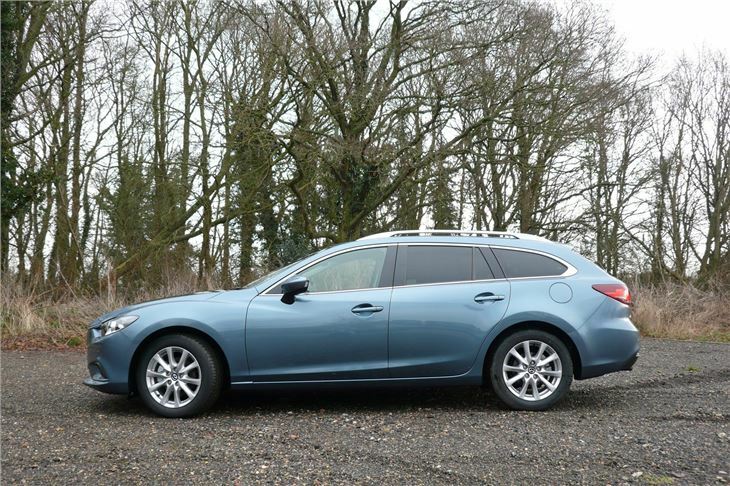 This test covers the latest 2015 Mazda 6 Skyactiv D 150 SE-L Nav automatic, and, to give a bigger picture, this time it’s the Tourer. Changes inside are a new stitched leather effect dash, new 7” multimedia touch-screen with Bluetooth and satnav, like the Mazda 2 and Mazda 3. For safety, you control the functions with console knob when you’re on the move. 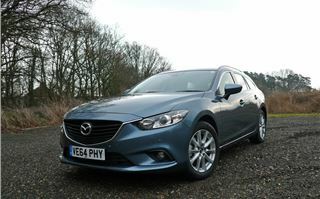 As tried a fortnight ago in the Mazda 2, the best satnav I’ve ever used. The radio is now DAB. They’ve done away with the mechanical handbrake and replaced it with an electric system, which I’d rather not have, but at least it works well enough. To reduce tyre roar, they’ve changed the suspension settings and done a lot of work on noise, vibration and harshness to give it a quieter, better ride. That all works fine. The steering wheel is still the right size, the steering is the right ratio and there’s still some feel. It’s just not quite as meaty as it was before. 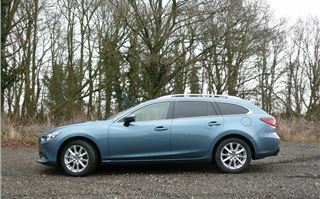 The 150PS, 380Nm 2.2 lire Skyactiv diesel still has bags of grunt and the 6-speed torque converter automatic transmission remains the best of any car this sort of size. It changes smoothly and sweetly and, unless you’re really pressing on, you simply don’t miss the paddleshifts that you get as standard in the Sport Nav version. 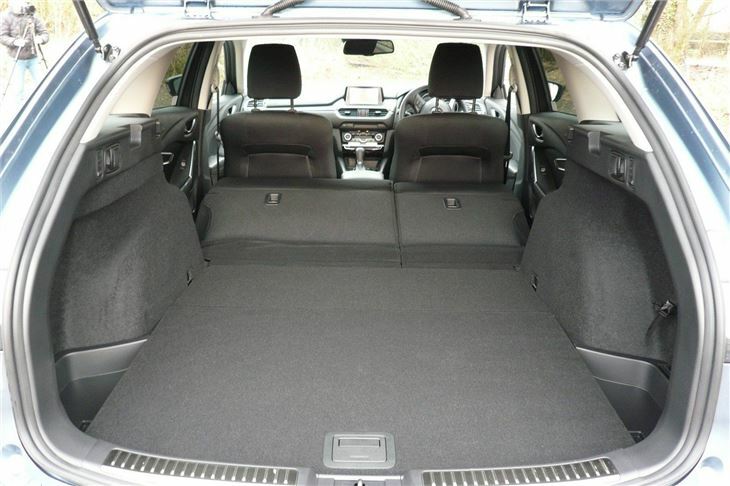 Round the back of the Tourer, you get Mazda’s excellent Karakuri catches to drop the back seats. 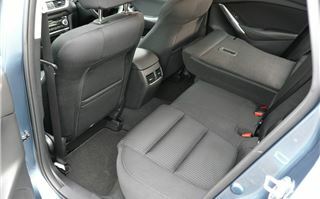 This has been fitted to all Mazda 6s right hack to the first generation. And, to please the likes of George Fowler (‘Motormouth; of ‘The Star’), you get two very neat, built-in shopping bag hooks. 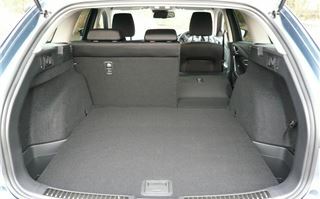 A very important feature is the City Brake Support Pack fitted as standard to SE-L, SE-L Nav and Sport Nav grades. This stops the car from low speeds if it encounters an obstruction, such as a pedestrian, a pram or a bollard (or me in the video). The Sport Nav has received a bit more work, in the form of a new grille, LED headlights, LED foglights and glossy new 19” alloy wheels. 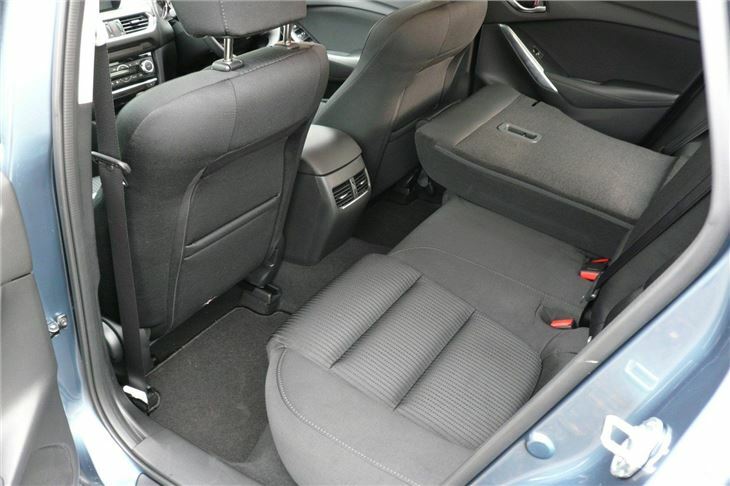 Inside, both leather covered front seats are now electric with tilt and lumbar control, you get a heads-up speed and satnav display in your line of sight, a reversing camera. And, if you opt for the £800 Safety Pack on the Sport Nav you get clever adaptive LED headlights designed not to blind oncoming drivers, Smart City Braking at the rear to stop the car from low speeds if you are reversing into a wall or fence. 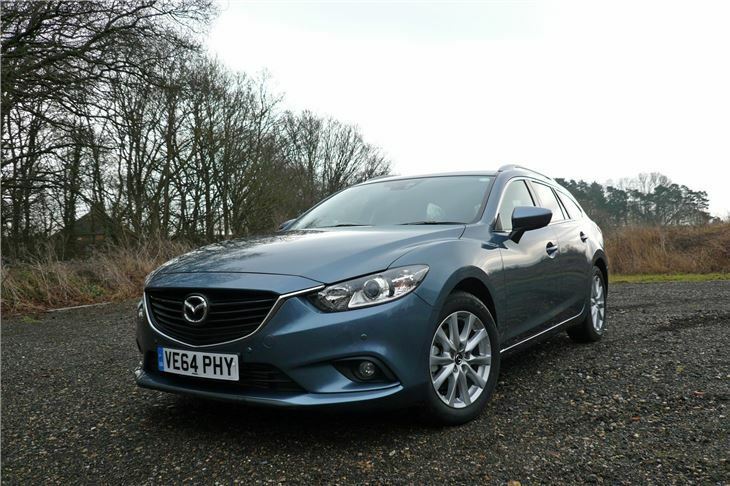 The system also includes ‘Rear Cross Traffic Alert’, so if you’re reversing out of a parking place and a car or a person is about to cross your path, it stops the Mazda and avoids a collision. When you have to drive a car past a camera over and over again, which means turning round over and over again in the end of a street or a driveway, you get to know how it performs when you’re not attempting to evaluate it, but when it has the capability to intensely irritate you. After sixteen turnarounds to drive past videographer Matt, it not only passed that particular test, it felt like an old friend I hadn’t seen for a year. 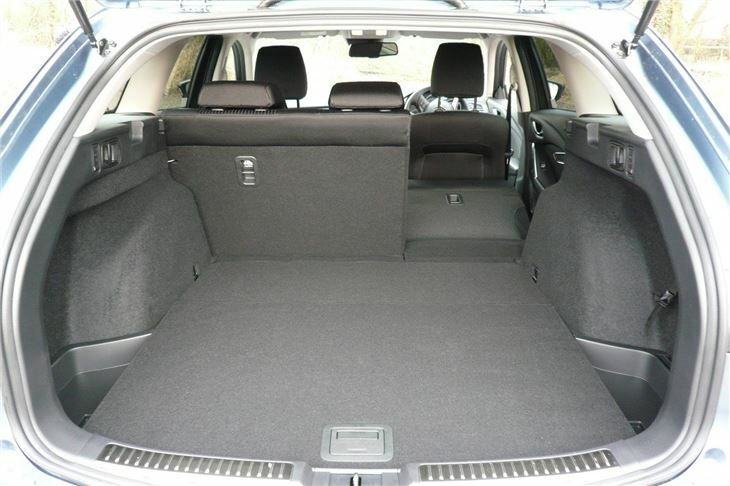 The only downer is no spare wheel (though happily there’s enough space for one). Instead, they give you a tyre repair kit that doesn’t work on anything worse then a pinprick, so my advice is to try to get the tyre plugged by the RAC rather than chance using the glop and ruining the carcass of the tyre. That aside, to my mind the Mazda 6 still leads the pack. 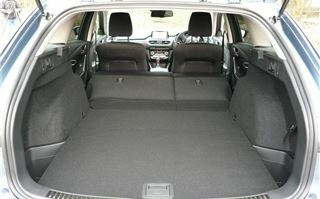 I’m going to take a lot of convincing by the new Mondeo and by the new Passat to alter that point of view. And when you check the list prices that start at £19,995 and end at £28,795 (up only slightly on before), you soon realise that spec for spec you’re getting about £5,000 more car than the Germans and the Swedes will let you have for that kind of money.